Growth momentum remained intact in the East and South Asia (ESA) region in Q4 due to strong global demand, particularly for electronic devices and semiconductors; solid capital inflows; and loose monetary policies across the region. A preliminary set of data for ESA countries showed that aggregate GDP for the region rose 6.3% annually in Q4, driving growth for 2017 to 6.3% (2016: +6.1%). Q4’s print matched the result in Q3 and was above the 6.1% forecast in last month’s report. The resilient growth figure was mainly the result of a better-than-expected performance in China, despite earlier signs signaling a moderation in momentum. China is managing to continue its slow-but-steady transition towards an economic model based on services and consumption. Although analysts believed that the transition costs would materialize in the form of weaker growth rates, robust global external demand and resilient household spending are so far allowing the Chinese economy to keep growing at a healthy rate. GDP expanded 6.8% year-on-year in Q4, in line with Q3’s result. While the National Bureau of Statistics does not provide a breakdown of GDP by expenditure, additional data confirmed that, despite some weaknesses, private consumption remained strong in Q4. Investment activities continued to slow, partially reflecting tougher environmental regulations. Moreover, growth in services accelerated in the same period, contrasting the likely deceleration in the industrial sector. With Q4 GDP still outstanding for the remaining countries in the region, recent economic indicators suggest that growth momentum picked up in India. Investment and external demand appear to have been the main drivers of growth in the October–December period, coupled with robust private consumption. High-frequency economic indicators suggest that growth in Korea remained resilient in Q4, albeit decelerating from Q3’s astonishing growth rate. Healthy external demand again fueled economic activity in the country. The ESA economy should continue to fire on all cylinders this year as the tailwinds that propelled growth in 2017 persist. The expansion in global trade seems more durable than previously expected, which bodes well for Asian factories. This will translate into stronger manufacturing activity and further gains in the labor market. Despite the ongoing tightening by the U.S. Federal Reserve, still-accommodative monetary policies by the Bank of Japan and the European Central Bank will support capital inflows into the region, keeping interest rates low. FocusEconomics panelists expect the ESA economy to grow 6.1% in 2018, which is up 0.1 percentage points from last month’s estimate. For 2019, analysts project regional growth will remain broadly stable at 6.0%. This month’s upgraded outlook for 2018 reflects improved growth prospects for China, Hong Kong, Korea and Mongolia. Projections were left unchanged for the economies of Bangladesh, Pakistan, Sri Lanka and Taiwan. India was the only economy to experience a downgrade this month. Despite early signs of a loss of momentum in Q4, the Chinese economy showed its strength once again and posted another solid reading for the quarter. GDP expanded 6.8% annually in Q4, matching Q3’s result and leading the economy to rise a strong 6.9% in the full year 2017. While resilient private consumption and service activities continued to drive growth in Q4, the economy greatly benefited from strong global demand. Conversely, investment growth continued to moderate in Q4 amid the government’s efforts to curb pollution and overcapacity in certain industries. Since the economy is doing well, the government will likely speed up the implementation of some of the reforms that were unveiled in the December Central Economic Work Conference. Further details will be disclosed at the March 2018 National People’s Congress. Economic growth will decelerate this year due to a cooling housing market, the government’s tighter environmental regulations and moderating external demand. While the deceleration will be part of the government’s plan to achieve a more balanced economic model, renewed tension with the U.S. over trade disputes and a disordered financial deleveraging could prompt the economy to slow down abruptly. FocusEconomics panelists forecast that the economy will grow 6.5% in 2018, which is up 0.1 percentage points from last month’s forecast. In 2019, the economy is expected to grow 6.3%. Leading data continue to point to an economic turnaround in the second half of FY 2017—which runs from October to March—as the impact of recent reforms, including demonetization and the implementation of the Goods & Services Tax, ebbs. Industrial output expanded at the fastest clip in five years in November, while both the manufacturing and services PMIs for December signaled improving operating conditions in the domestic economy. The risks of fiscal slippage, however, have increased recently. The government’s cumulative fiscal deficit between April and November was at 112% of its full-year target, with expenditure on track to meet the target but revenues persistently lagging behind. Chances that the government misses its fiscal deficit target of 3.2% of GDP for FY 2017 have increased, and substantial public expenditure cuts may be needed before the end of March if authorities are to meet the target. Economic growth is likely to firm up in FY 2018 as one-off disruptions continue to fade and strong global growth buttresses the external sector. Nonetheless, fiscal discipline could limit the extent of the rebound, while higher inflation could see a tighter monetary stance. Our panel expects growth of 7.3% in FY 2018, which is down 0.1 percentage points from last month’s estimate. In FY 2019, panelists forecast a GDP expansion of 7.4%. Following an exceptional performance in the third quarter of 2017, in which annual growth rose to the highest rate in nearly four years, the economy appears to have cooled in recent months but nevertheless continued to display strength. Industrial production fell in November compared to the same month a year earlier as output in the manufacturing sector decreased. However, tax revenues surpassed government expectations in the 11 months up to November and, in December, consumer confidence remained high and the external sector was in good shape. Meanwhile, on 5 January, government officials from Korea—which has a large trade surplus with the U.S., mainly stemming from the automobile sector—met with their U.S. counterparts to begin a review of the two countries’ bilateral trade agreement. As part of this review, the U.S. is expected to especially push for better market access in Korea’s automobile sector. And, in a possible sign of its tough negotiating stance, the U.S. announced import tariffs on 22 January, affecting washing machine imports, that will hit Korean exports. 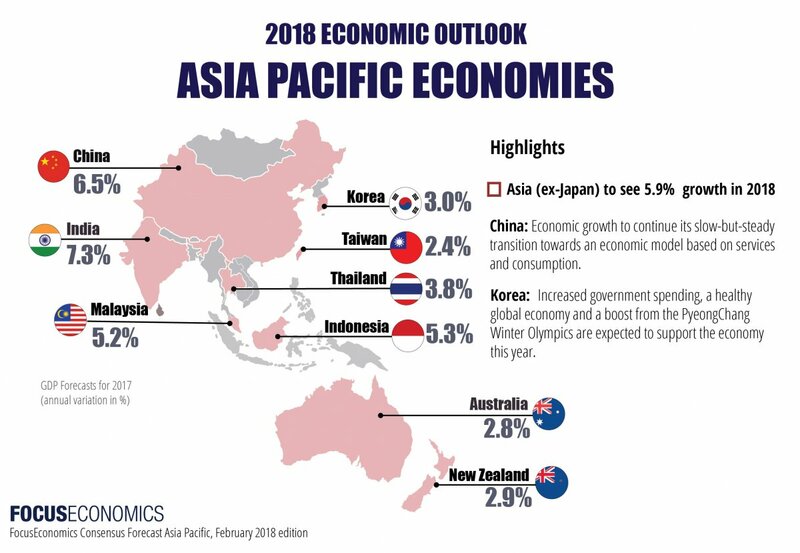 Increased government spending, a healthy global economy and a boost from the PyeongChang Winter Olympics are expected to support the economy this year. However, government measures to tame the housing market could weigh on the growth outlook, with construction investment expected to slow. FocusEconomics panelists forecast economic growth of 3.0% in 2018, which is up 0.1 percentage point from last month’s forecast. In 2019, they foresee an expansion of 2.8%. Inflation in East and South Asia came in at 2.4% in December (November: 2.2%), according to an estimate by FocusEconomics. The reading reflected higher price pressures in China, India, Korea, Pakistan and Taiwan. Conversely, inflation moderated in Bangladesh, Mongolia and Sri Lanka. The Bank of Korea decided to keep its key policy rate unchanged at its 18 January meeting, in contrast with the interest rate hike that the Bank had delivered in November. Despite the pause in its monetary policy tightening, our analysts believe that the Bank will continue to hike interest rates this year on the back of strong economic growth. Although inflation will likely remain at relatively low levels throughout 2018, risks are now skewed to the upside. Oil prices continue to trade higher in response to a tighter crude oil market, food prices are set to rise due to lower production and robust economic growth will fan demand-side pressures on prices. As a result, panelists polled by FocusEconomics project average inflation of 2.7%, which is up 0.1 percentage points from last month’s estimate. Inflation is expected to remain stable at 2.7% in 2019. Looking for forecasts related to in East & South Asia ? Download a sample report now.